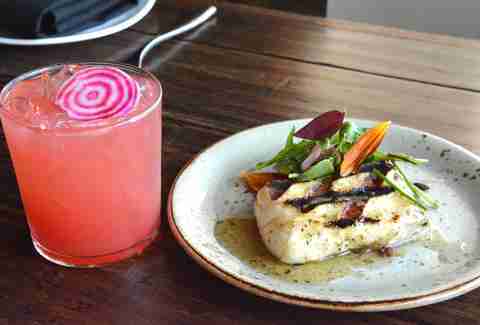 Eating well in DC can be crazy expensive. But it doesn’t have to be! These 16 spots will wow you on the cheap. If you don’t see something you like (and if you don’t, what’s wrong with you? ), you can always slurp down five tiny $1 oysters and still feel hangry or pound pizza by the slice. Note: a few of these check in at a few pennies over $5, but if you’re worried about that just go scrounging in your couch and you should be good to go. It’s Thursday. That means all you have to do in the office tomorrow is remember to close your cat video window when you boss gets within 10ft of your cubicle. Celebrate making it through at The Black Squirrel’s burger night when you can get a classic or veggie burger plus boardwalk fries or a salad for $5.49. Lettuce and tomatoes are included because the bar cares about you growing big and strong, but bacon is extra (but worth it!). 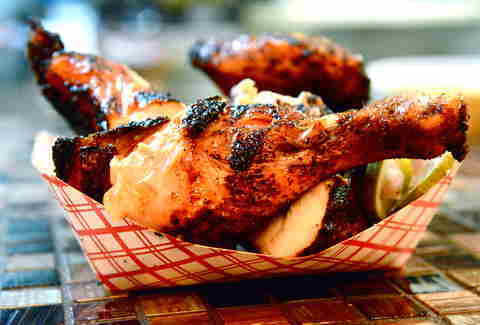 You can get five of DCity Smokehouse’s habit-forming, Pit Smoked Wings for an even $5. They’re dry-rubbed with what we can only imagine is pixie dust or something equally magical before being smoked with two kinds of wood. The only decision you have to make is whether you want to drench them in cilantro ranch or chipotle aioli. Note: they’re a dollar off on Wednesdays. Single pieces of nigiri sushi and sashimi are only $1 during Baan's sushi happy hour from 5-7pm during the week. Translation: if you live and die by the sushi roll, this deal will not help you. Plunk down at the sushi bar and start ordering the usual suspects: tuna, eel, octopus, salmon, shrimp, squid, yellowtail, and more. We suspect it launched this sweet deal because the special Baan Thai menu served in the same space is blowing up. You don’t have to wait until Tuesday to eat cheap just because it’s the first day of the week to form an alliteration with the word taco. El Camino serves $2.50 and $3.50 tacos seven days a week, including carnitas (you jealous Chipotle? ), chicken tinga, and Baja fish. The only thing that would make El Camino better (cough cheaper) is if the chips & house-made salsas were free. Kapnos champions the idea that happy hour shouldn’t just be for discounted drinks. 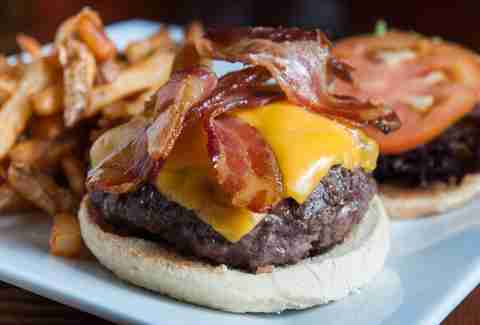 It makes its food menu more affordable from 5-7pm seven days a week in the bar area. Nine different bites are available for a five spot including the star of the show -- grilled haloumi cheese drizzled with black pepper honey. The generous portion will do more than tide you over. Other $5 options: dolmades (grape leaves), roasted duck phyllo pie, falafel, blistered shishito peppers, and Greek fries. Decide whether you’re in the mood for something salty or something so sugary, your teeth will twinge because DC9 has two types of balls for $5. 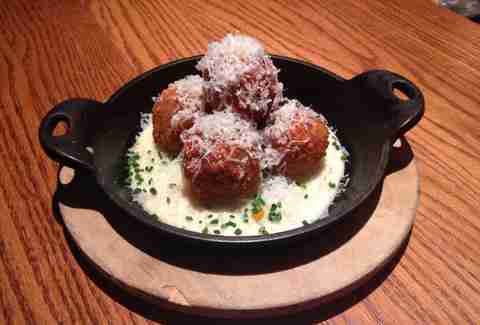 Savory fans will dig the hush puppies served with a three-pepper jam. They’re fried golden brown, but don’t feel guilty about eating fried food -- the nightclub uses a company to convert spent fryer oil into bio-diesel! Dessert freaks will dig the $5 Bourbon Balls made from Maker’s Mark, pecans, vanilla wafers, and chocolate. There’s not a damn thing on Copycat’s food menu for more than $4. Food that cheap in a slick bar setting is worth almost getting clipped by the streetcar forever stuck in test mode. Four kinds of potstickers are two for $1.50; bao buns are $1.25 each; and skewers of chicken, skirt steak, or lamb shoulder are $4 each. The drink prices aren’t as generous, but that’s because they come with a sidecar of education (check out the informative drink menu that cites its sources). Follow signage depicting a penguin butler wearing mariachi band gear to find this somewhat secret burrito joint down a side alley off 19th St NW. 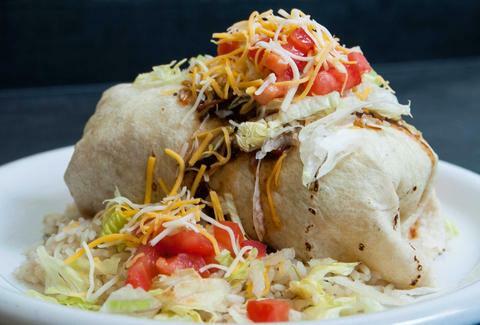 It serves four burritos that won’t burn a hole in your pocket: marinated beef ($5.75), marinated chicken ($5.50), and bean & cheese/sautéed veggie ($5.25). 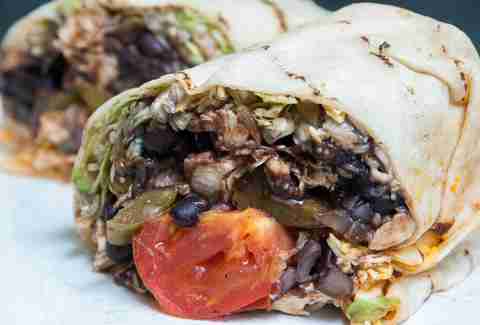 They all come stuffed with black or refried beans, lettuce, Mexican rice, shredded cheese, sour cream, and tomatoes. 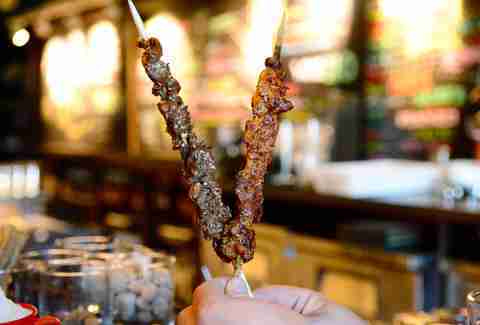 The happy hour at Dino’s Grotto is already long enough for you to get your hands on discounted eats (5-7pm Tues-Sat), but where it really slays it is by offering happy hour all day on Sunday and Monday. Try a “fried cheese sammy” that sounds way better in Italian: Mozzarella in Carrozza. It’s $5. So too is duck neck. Deviled eggs, duck fat potatoes (pictured), fried tomatoes, house-pickled ramps & long green beans are all $4. Don’t confuse Tortilla Café with Tortilla Coast, the Republican stomping ground up the street. After all, Tortilla Café was the one that landed itself on Diners, Drive-ins and Dives. You’re ordering either the tamale platter or empanada platter for $5.45, both of which come with two sides (we dig the yucca and plantains). Not hungry enough to take that on? Order a couple of $2 pupusas filled with just cheese or pork and cheese. A bar that’s still a little too tidy to be called a dive bar is still willing to serve dive bar-priced food. And thank God for that if you happen to be both starving and swinging past Ivy & Coney on your way home from blowing serious cash on $14 cocktails. Just don’t expect a big menu. Chicago-style or Detroit coney-style hot dogs are available for $4 each along with baseball game snacks like Cracker Jacks. The dogs are especially meaningful for Chicago and Detroit folk who miss home. Mazel tov to the lad at DGS who thought to put Canadian-Jewish fusion food on the happy hour menu. 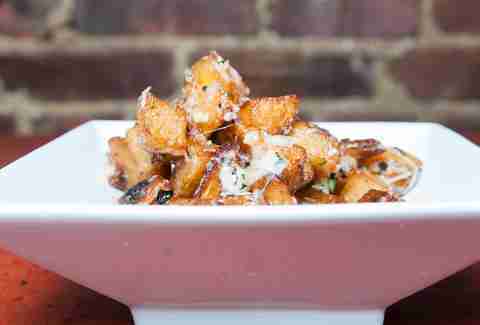 You’ll never want boring fries or even slightly more exciting tots to form the base of your poutine again after trying the dish with latkes. And that’s not the only $5 option on the happy hour menu. Reuben egg rolls, brisket sliders, pastrami chili fries, and more are also available Mon-Fri from 4-7pm. Squeaking in at $5.99 is a big, satisfying bowl of ful at Keren Restaurant. The dish of mashed fava beans topped with tomato, onion, jalapeño, yogurt, olive oil, and berbere is typically eaten for breakfast, but that’s okay since Keren serves breakfast all day. 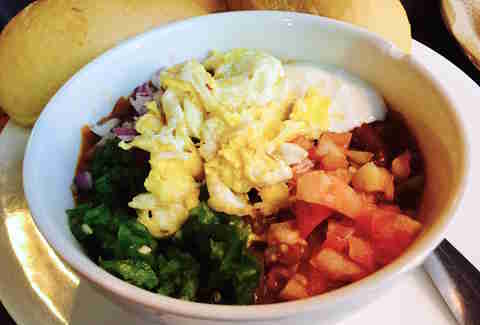 Without the distinct berbere flavor, a bowl of ful might remind you of a seven-layer dip or vegetarian chili. The bowl carries the weight of a football, so expect to be ful (!) all day. Few free associate tacos when they think of Smoke & Barrel. The Adams Morgan BBQ beast is better known for its brisket and wings. But something magical happens every Tuesday. 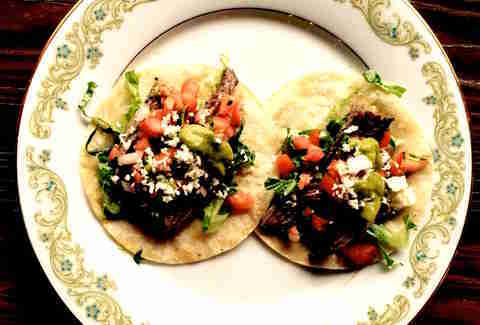 It busts out a special menu that allows diners to order three tacos and a side for $5 until 11pm. Choose from pulled pork, pulled chicken, smoked tofu, or veggie chili, then decide if you want them BBQ style (hint: you do) or traditional style. Sides include cheddar grits, coleslaw, and mashed potatoes. The underground lair of Urbana has been a happy hour champ for years because it's never stingy. We all held our breath when the restaurant went through a snazzy redesign, hoping the same awesome deals would emerge on the flip side and they sure did. From 3-7pm you can snack on $5 bites including the basics like nuts and olives in addition to big fat arancini and a bowl of a fritti misti. If you’re with a bud also willing to throw in a fiver, you can split a margherita, garden, or sausage pizza. 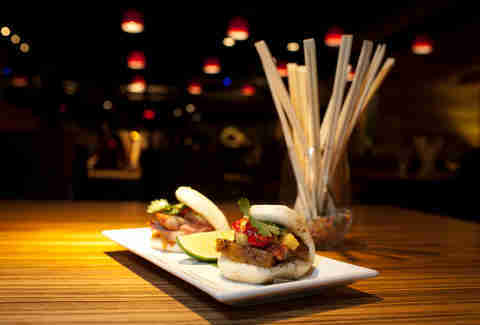 During Zengo’s lengthy happy hour (3-8pm on Mon-Fri) adobo chicken steamed buns (served with cucumber kimchee and cilantro) are $5. They make the perfect pre-movie snack. Edamame and a zippy green papaya salad are also $5 during happy hour. Cervezas cost the same in case you’re looking to drink your dinner.